In the center of each of these frames is one of the newfound bright ultraviolet galaxies spotted by NASA's Galaxy Evolution Explorer. Astronomers have spotted three dozen bright, young galaxies that defy the general aging trends of the universe. The galaxies, fairly nearby and massive, are more youthful than they ought to be, based on current theory. They look like the sorts of galactic toddlers or teens that astronomers find when they look across tremendous distances, and therefore way back in time to the early universe. "We knew there were really massive young galaxies eons ago, but we thought they had all matured into older ones more like our Milky Way," said Chris Martin, principal investigator for NASA's Galaxy Evolution Explorer at the California Institute of Technology. "If these galaxies are indeed newly formed, then this implies parts of the universe are still hotbeds of galaxy birth." It is not totally unreasonable for galaxies to still be forming. Other surveys have found smaller galaxies in the making. But because the universe has been expanding since birth, material that was once huddled close in ideal star-forming density has steadily spread out for 13.7 billion years. Building a major galaxy is harder these days. Stars develop anytime gas collapses under its own weight. The gas is generally part of a galaxy, and galaxies use their heft to pull in surrounding gas, a process that compresses the gas and triggers star birth. A study earlier this year estimated that star formation in the universe peaked about 5 billion years ago, just prior to the birth of our Sun. Up to that time, collisions between galaxies were more common than today, and that is thought to have contributed to star formation, too. The newfound galaxies are relatively nearby, ranging from 2 billion to 4 billion light-years away. A light-year is the distance light travels in one year, about 6 trillion miles (10 trillion kilometers). If something is 2 billion light-years away, it is seen as it existed 2 billion years ago. 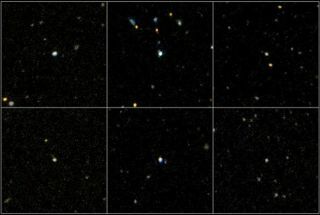 Astronomers said Tuesday the orbiting observatory had captured light that left the galaxies when they were anywhere from 100 million to 1 billion years old. Our Milky Way, a mature galaxy, is at least 10 billion years old. It is fortuitous to find developing galaxies so nearby, because instead of seeing mere pinpoints of light from clear across the cosmos, astronomers can observe structure in these galaxies. "Now we can study the ancestors to galaxies much like our Milky Way in much more detail than ever before," said Tim Heckman of Johns Hopkins University. "It's like finding a living fossil in your own backyard. We thought this type of galaxy had gone extinct, but in fact newborn galaxies are alive and well in the universe." The telescope, launched last year, surveyed tens of thousands of galaxies to ferret out a handful that are each about 10 times brighter than the Milky Way in ultraviolet light. The intense UV radiation indicates the galaxies are rife with hot, young stars, the sort that are massive, die young, and explosively seed a galaxy with heavier elements that go into making the less massive, longer-lived stars common to a grown-up galaxy. The results will be published in a special issue of Astrophysical Journal Letters.